I love the crisp, clean colors of blue and white, especially in my dining room. By mixing these classic colors with different textures and patterns it is the perfect autumn room to enjoy with my family and friends. 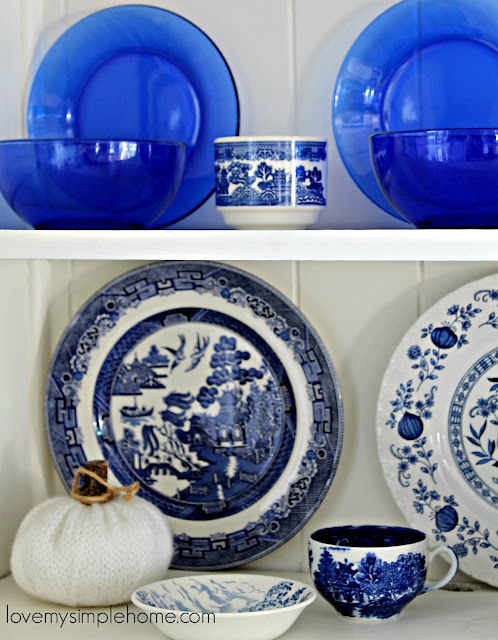 I am Continuing the blue and white color palette for fall. It is early fall and the leaves have not changed yet so I kept the fall decor to a minimum. I added textures like the baskets and the metal sign in warm colors. As we progress further into fall when the leaves start to change I will add more of the rich colors of fall. 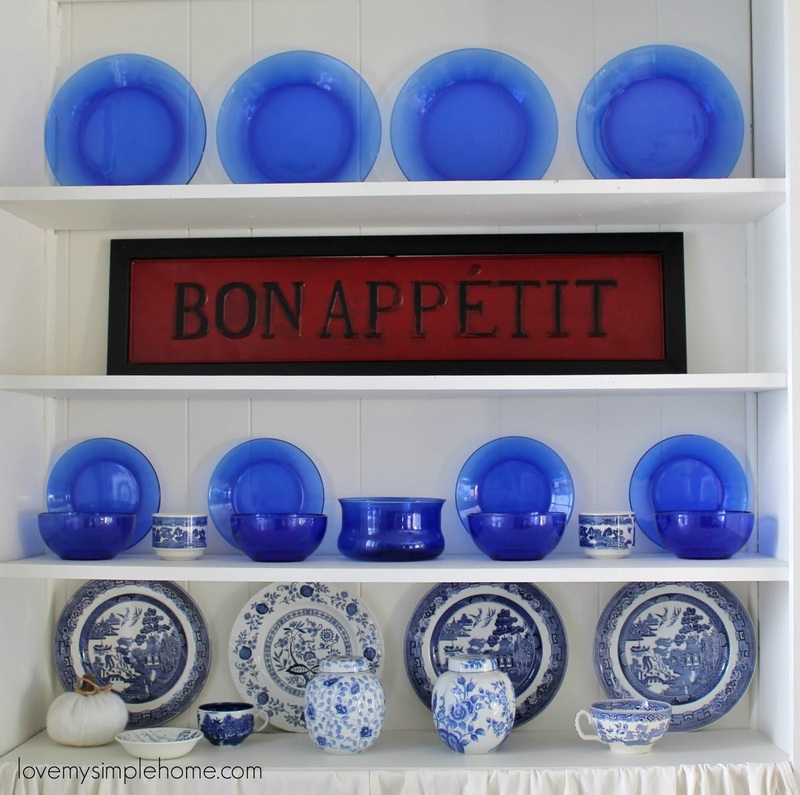 For a quick transition into fall, I added a metal sign with a deep red hue to the middle shelf and balanced the rest of the shelves with the glass blue plates. 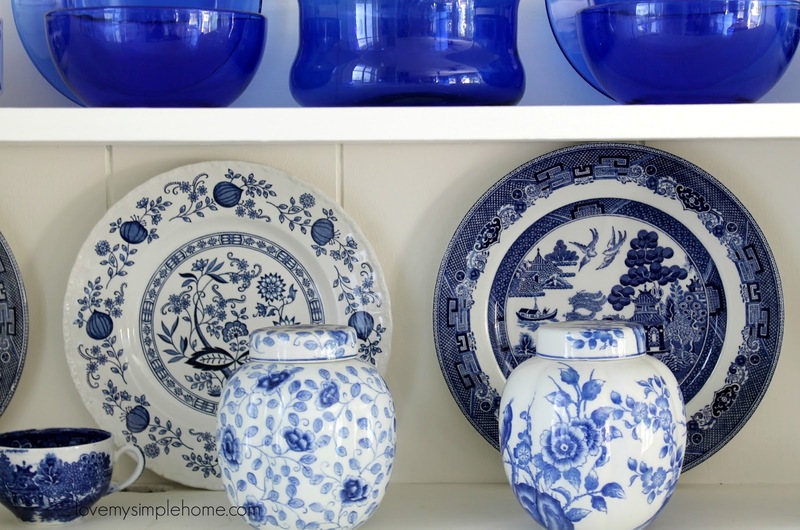 My collection of everyday blue transferware is displayed on the bottom shelf. Grouped together they make an artful display. The knit pumpkin that I made adds a whisper of fall. The decorative plates that can't go in the dishwasher or microwave are hung in sets of three on either side of the industrial stainless steel cabinet. 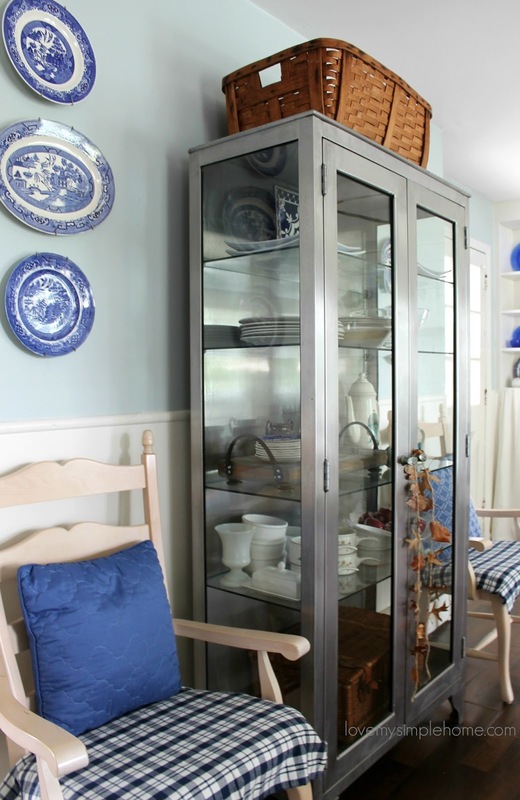 I use this cabinet to store our everyday dishware and other essentials. There will be more about this cabinet in an upcoming post. 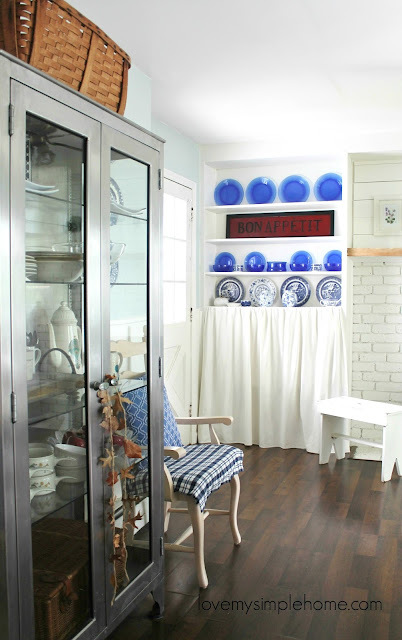 The large antique basket on top of the cabinet is for storage and also adds a warm texture and color for fall. I made a simple leaf garland and hung it on the door of the cabinet. The plaid fabric and blue pillows add a pop of color to this space. Ginger jars are great for storing tea or coffee. I used two in this display. 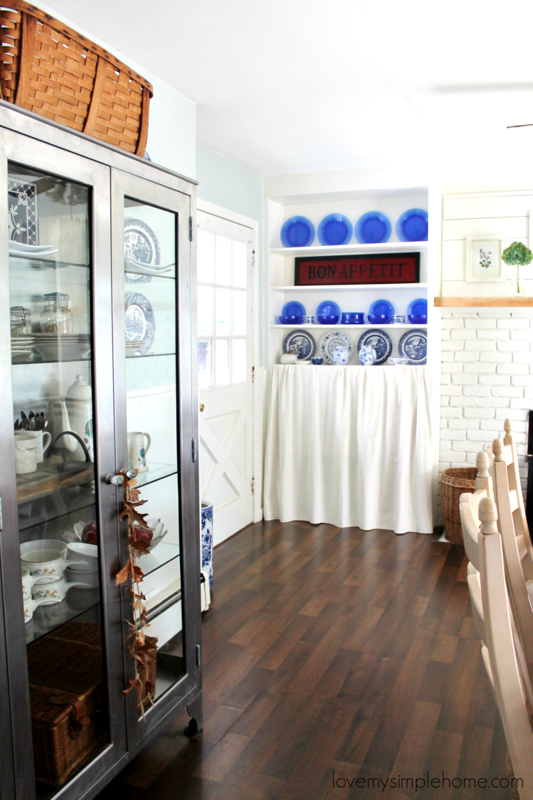 I hope you enjoyed this mini fall tour of my blue and white dining room. There will be more peaks inside this room so please come back. 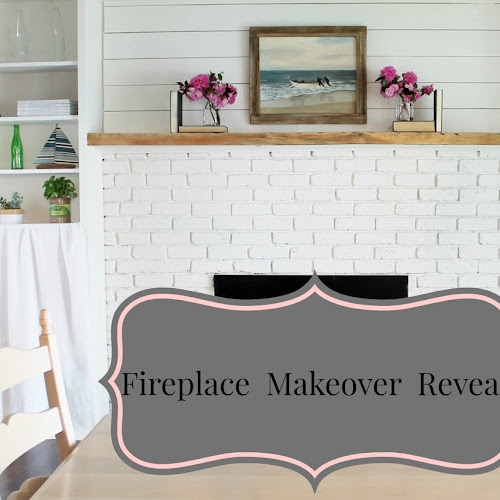 If you want a similar look in your home for fall, thrift stores and yard sales are great options for finding dishware. If you rather shop online in the convenience of your home, I recommend Amazon.